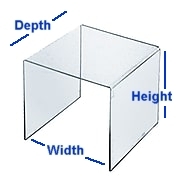 Great for product displays, tradeshows, pedestals, specials, home decor, etc. 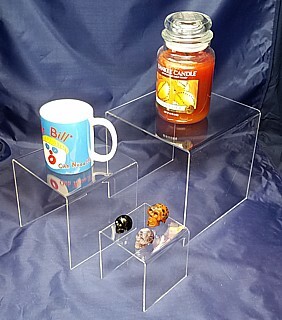 Our Clear Acrylic Risers are High Quality, Durable Units to Make Your Products STAND OUT! We offer 1/8" Lighter Weight Risers, 1/4" Heavier Duty Risers and 3/8" Super Thick Heavy Duty Risers in Many Sizes to Suit Your Needs. Also Sold In Sets to Make Your Task of Designing the Perfect Layout of Products an Easy Task. AR2 2" x 2" x 2" 1/8"
AR3 3" x 3" x 3" 1/8"
AR4 4" x 4" x 4" 1/8"
AR5 5" x 5" x 5" 1/8"
AR6 6" x 6" x 6" 1/8"
AR7 7" x 7" x 7" 1/8"
AR8 8" x 8" x 8" 1/8"
AR234 Set 2", 3", 4" 1/8"
AR2-8 Set 2", 3", 4", 5", 6", 7", 8" 1/8"
AR345 Set 3", 4", 5" 1/8"
AR357 Set 3", 5", 7" 1/8"
AR468 Set 4", 6", 8" 1/8"
ART2 2" x 2" x 2" 1/4"
ART3 3" x 3" x 3" 1/4"
ART4 4" x 4" x 4" 1/4"
ART5 5" x 5" x 5" 1/4"
ART6 6" x 6" x 6" 1/4"
ART7 7" x 7" x 7" 1/4"
ART8 8" x 8" x 8" 1/4"
ART9 9" x 9" x 9" 1/4"
ART10 10" x 10" x 10" 1/4"
ART11 11" x 11" x 11" 1/4"
ART12 12" x 12" x 12" 1/4"
ARTSET1 Set of 6", 8", 10", 12" 1/4"
ARTSET2 Set of 6", 8", 10" 1/4"
ARTSET3 Set of 2", 3", 4" 1/4"
ARTSET4 Set of 4", 5", 6", 8", 10", 12" 1/4"
TART14 14" x 14" x 14" 3/8"
TART16 16" x 16" x 16" 3/8"